Damage caused by suffragettes. View of the railway station at Saunderton, UK after it was burned down by suffragettes. The British suffragette movement was a militant activist group that campaigned for the right to vote for women in the UK. It's leader, Emmeline Pankhurst founded the Women's Social and Political Union (WSPU), an all-women suffrage advocacy organisation dedicated to 'deeds, not words'. The group was widely criticised for its militant tactics, which included physical confrontations such as smashing windows and assaulting police officers, but is recognised as being instrumental in achieving women's suffrage in Britain. 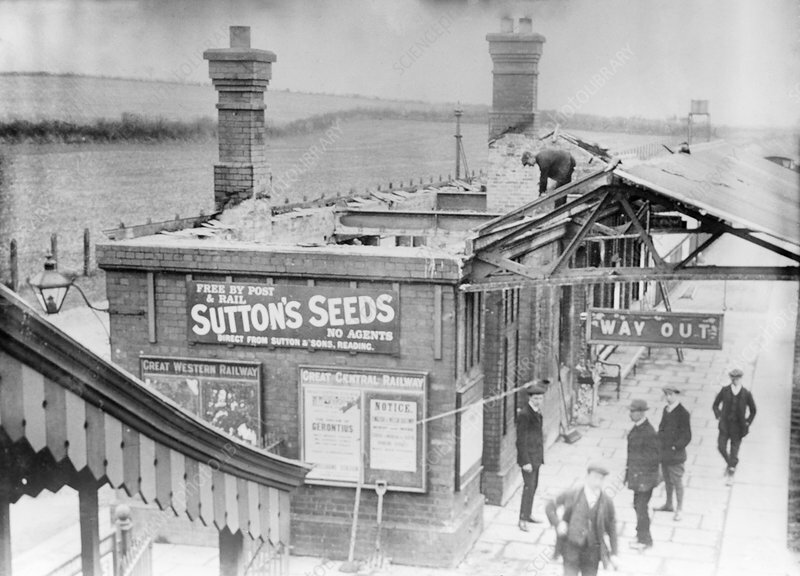 The main building of Saunderton station was burned down in March 1913 by suffragettes Olive Wharry and Lilian Lenton during a series of arson attacks in London. Photographed in 1913.